Cancale is a town on the northern coast of Brittany to the east of Saint-Malo where it is at the start of the section of coast known as the Emerald Coast. The town is divided into two areas, with the main town on a headland and the port called La Houle, with a steep cobbled street between the two parts. France This Way comment: allow plenty of time for your visit to Cancale: although the town is quite small you will need time to sample the oysters and also two-three hours for the path to the Pointe du Grouin, an unmissable part of your visit! 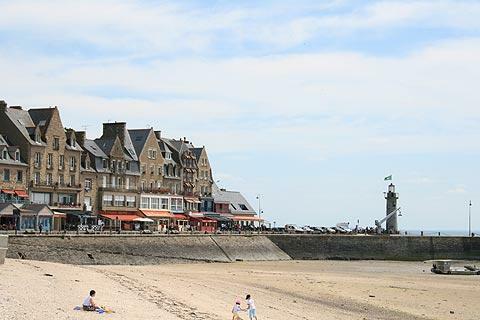 Start your visit to Cancale on the seafront with a walk around the harbour and then on to the pier from where you can see the oyster beds stretching as far as the eye can see, all seven square kilometres of them! The harbour (at La Houle) is surrounded by pretty old fishing houses (many of them now restaurants and shops) and the highlight of a visit - there are numerous restaurants in Cancale where you can sample the local produce, especially the 'oversized' oysters for which the region is best known. 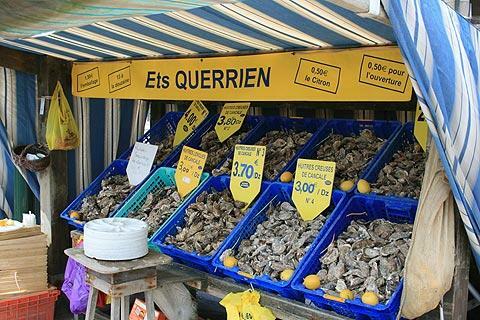 There are also a few stalls on the sea-front selling the oysters each day and the town also has a 'Museum of Oysters'. The town has built a reputation due to the oyster beds that are along the coast and round the harbour at Cancale and is best known as being the oyster capital of Brittany. Cancale oysters have been famous for at least 2000 years since the days when they were eaten by the soldiers of Julius Caesar and later when they were delivered daily to Louis XIV. Cancale oysters are thought to be some of the best available. 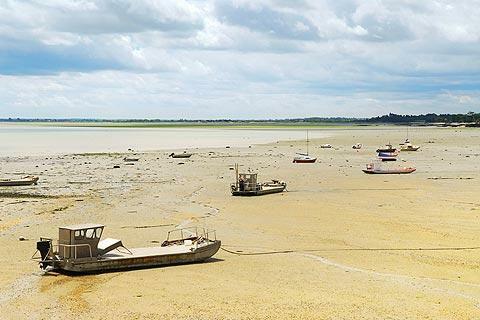 In 1994 Cancale was classified as a ‘Site remarquable du goût’, a town remarkable for the taste of its oysters! Cancale produces 5000 tons of oysters farmed in its ‘parks’ in the bay and 1000 tons fished from the bay generally. After exploring the harbour of La Houle, the small town of Cancale itself is a traditional fishing town with granite houses clustered around the 18th century Church of Saint-Méen. 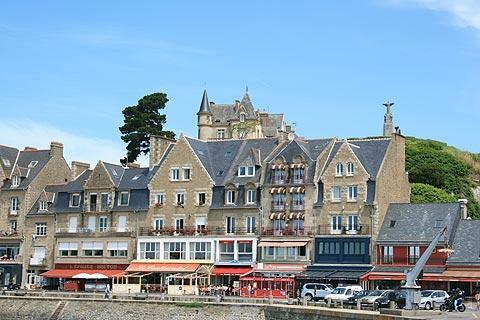 There are also several beaches to be found near Cancale - for example the attractive Plage de Port-Mer. After exploring Cancale, head out on foot along the Sentier des Douaniers to the headland at Pointe du Grouin. Starting from the oyster park in Cancale, this route passes through lovely scenery along the coast and along the path you also get good views of small islands and across to Mont Saint Michel, and as far as Granville and Cap Fréhel. The abbey at Mont-Saint-Michel is of course an indispensable part of a visit to Cancale, with a visit to the historic town of Dol-de-Bretagne also highly recommended.